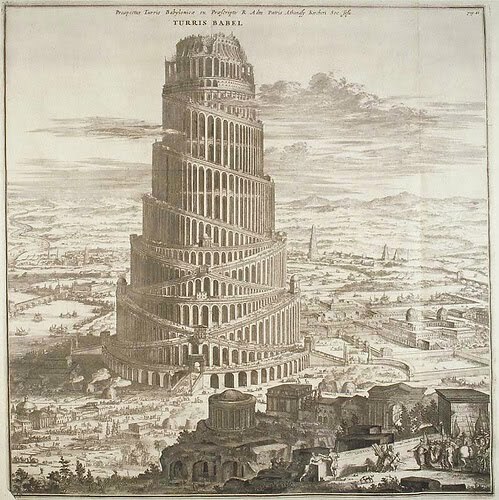 Babylon is a towne not very great but very populous, and of great traffike of strangers, for that it is the way to Persia, Turkia and Arabia : and from thence doe goe Carovans for these and other places. Here are great store of victuals, which come from Armenia downe the river of Tygris. They are brought upon raftes made of goates skinnes blowne full of winde and bordes layde upon them: and thereupon they lade their goods which are brought downe to Babylon, which being discharged they open their skinnes, and carry them backe by Camels, to serve another time. Babylon in times past did belong to the kingdome of Persia, but nowe is subject to the Turke. Over against Babylon there is a very faire village from whence you passe to Babylon upon a long bridge made of boats, and tyed to a great chaine of yron, which is made fast on either side of the river. When any boates are to passe up or downe the river, they take away certaine of the boates untill they be past. The Tower of Babel is built on this side the river Tygris, towardes Arabia from the towne about seven or eight miles, which tower is ruinated on all sides, and with the fall thereof hath made as it were a litle mountaine, so that it hath no shape at all: it was made of brickes dried in the sonne, and certaine canes and leaves of the palme tree layed betwixt the brickes. There is no entrance to be seene to goe into it. It doth stand upon a great plaine betwixt the rivers of Euphrates and Tygris. The voyage of M. Ralph Fitch marchant of London by the way of Tripolis in Syria , to Ormus, and so to Goa in the East India, to Cambaia, and all the kingdome of Zelabdim Echebar the great Mogor, to the mighty river Ganges, and downe to Bengala, to Bacola, and Chonderi, to Pegu , to Imahay in the kingdome of Siam , and backe to Pegu , and from thence to Malacca, Zeilan, Cochin, and all the coast of the East India: begunne in the yeere of our Lord 1583, and ended 1591, wherein the strange rites, maners, and customes of those people, and the exceeding rich trade and commodities of those countries are faithfully set downe and diligently described, by the aforesaid M. Ralph Fitch. Richard Hakluyt. The Principal Navigations, Voyages, Traffiques, and Discoveries of the English Nation Made by Sea or Overland to the Remote & Farthest Distant Quarters of the Earth at any time within the compasse of these 1600 Yeares.